Legendary: Big Trouble in Little China will take players on an epic thrill ride through Chinatown as they take on multiple versions of David Lo Pan and the classic villains, the Three Storms. Will you be able to save Miao Yin and Gracie Law from the clutches of Evil? Well as your old pal Jack always says, "I never drive faster than I can see. Besides that, it's all in the reflexes". 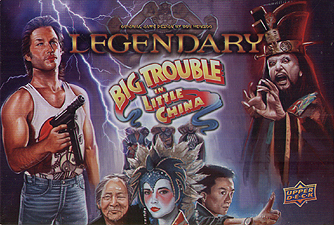 Legendary: Big Trouble in Little China is semi-compatible with other Legendary products.